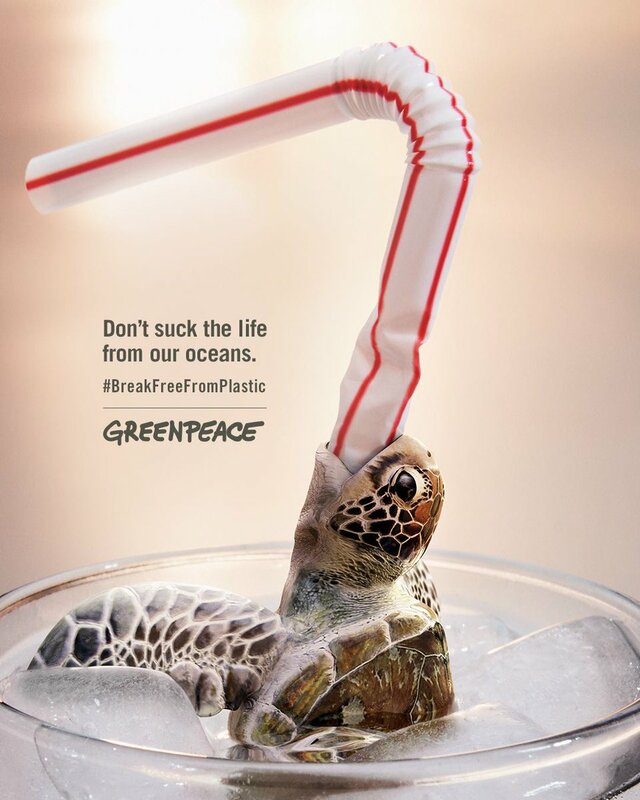 Since that video of a poor turtle in pain as a plastic straw was being pulled out from its nose went viral, people began to realize how this thing could hurt or even kill animals. And it pollutes the ocean, too. So restos started banning plastic straws. Or they provide alternatives like paper or re-usable straws, which I’m not really a fan of since it simply reinforces consumerism. Making us believe that life is better with straws when we could, in fact, survive without it. That’s the thing with consumerism. We have to keep buying stuff we don’t really need. Like those “eco bags” being marketed as the better option. How many of these do we exactly need? A growing mountain of re-usable bags, left unused (defeats the reason for its name), would end up as trash and we’re back to square one. But back to single-use plastic. This addiction is all about convenience. Using plastic bags is more convenient than always carrying and actually re-using a re-usable bag. Choosing plastic spoons and forks, and cups (and those paper plates are not any better) is more convenient than washing up. Buying bottled water is more convenient than carrying one’s own water tumbler. Drinking with plastic straws is more convenient than using one’s damn mouth to sip and gulp. We are drowning in plastic. Bits of it could now be found in our stomachs. So ditching the plastic straw is a good start. But it shouldn’t end there. Let’s be inconvenient together and ditch other unnecessary plastics, too. Just a bunch of innocent balloons. It’s all for fun. To make people revel at the moment. And break a record at that. But people didn’t buy it. “Stop this madness!” was the clamor. There were rants, and pleadings, and reasoning. A petition was made. Thousands of signatures collected in less than a day. Then the government intervened. A recipe for disaster for the poor capitalist. Could be the reason why it was an easy target. But surely, it’s people power at work. Damn if you do, damn if you don’t. As always. Holidays in Bhutan are celebrated planting trees. They don’t fly a balloon, or release sky lanterns, or choke the air with fireworks. And they don’t leave their garbage behind after the celebration. Better to be a kill joy than a “kill planet” as somebody puts it. Then again, one doesn’t have to harm the Earth for just a little bit of fun. UN’s Intergovernmental Panel on Climate Change report warns us that we may have only until 2030 to solve the issue of climate change. Basically, we have to limit warming to 1.5°C because the continuous increase in temperature has already given us a preview of what is to come – catastrophic typhoons and droughts, frequent flooding, deadly diseases, and these could get worse. Sounds like a Nostradamus prediction but it’s all real no matter how hard people like Trump deny it. Would this actually prod politicians, capitalists, and corporations to do something? If all hell breaks loose, they’re safely tucked in their ivory towers counting money. How can they sleep at night? Makes you want to punch them in the face. For instance, worst plastic polluters like Coca-Cola, PepsiCo, and Nestle make empty promises about reducing plastic waste which we’re practically eating already (Yep, microplastics were found in human poop!) There’s Monsanto controlling food production and promoting Genetically Modified Organisms (GMOs). The issue of GMOs is debatable but if you ask me, without comprehensive studies on the long-terms effects of consuming GMOs, I wouldn’t choose to eat them. In the Philippines, a developing country subscribing to the ideals of developed nations, urbanization is on a rush. Mountains are flattened and trees are cut to make way for concrete roads, and malls, and condos, and fastfood restos (making us all dangerously fat). The state of the environment is never a priority. We have this idea that we have the right to trash this planet (case in point, overtourism of Boracay leading to its closure). Eventually, we sadly face the consequences of our actions and they can turn out to be deadly. Lives were lost in the landslide in Itogon, Benguet and Naga, Cebu. And this is not something new. But corrupt government officials who don’t give a damn don’t do anything about it. I read about narcotization in Chuck Palahniuk’s novel, “Stranger than Fiction.” When a problem looks too big, when we’re shown too much reality, we tend to shut down. Are we shown too much of environmental decay that we have decided not to take any action? Why is it all bad news that we are made to see anyway? Someone said because good news can take care of itself, which makes a lot of sense. Speaking of good news, the ozone layer is healing! So we do have the capacity to turn things around. Maybe we can address climate change and plastic pollution and it won’t be the end after all. I hope. It is unfortunate that the only way to escape from our stressful busy lives and to re-connect with nature is when we visit places like Mount Purro Nature Reserve. Yet it’s a shame how a lot of tourists are obsessed over the Instagrammability of a destination. No wonder we face issues like overtourism, pollution, and commodification of culture. There should be a better or more sustainable way for tourism. This very theme was tackled during the SenseCamp 2018 organized by MakeSense, which is a two-day event that included discussions on various facets of sustainable tourism, different workshops, advocacy and awareness building, and opportunities for networking (Read about last year’s SenseCamp here). Melody Melo-Rijk from WWF-Philippines also talked about their project, “The Sustainable Diner: A Key Ingredient of Sustainable Tourism.” As discussed, one can be a sustainable diner by eating local, trying plant-based dishes, using reusable utensils, and not wasting food, among others. TJ Malvar, who helps manage the camp’s venue, Mount Purro, said that their goal is to be a truly sustainable travel destination. He admits that there’s a lot of work to do but the key is balance of the triple bottom line – profit, people, and planet. We normally think that when we take care of the environment, we are saving the planet. But in reality, we are doing so to save ourselves. When we travel, when we see the world, may we appreciate it and make an effort to protect it so the future may also have the opportunity to see and experience these places.